From 1954 until 1960 the camp used the facilities at Echo Bay and Fair Havens. Due to the growing interest and numbers of campers attending, it was decided that a permanent site should be found. The present site was located by early Board members, Tom Wilson, Kay Watts, Harry Robinson, and Margaret Robinson, the Pioneer Girls' Executive Director and camp director from 1959-1973. The price paid for the 100 acre parcel of land, 5 miles north of Walkerton, on the Saugeen River was $4200. After careful planning during the winter of 1960-61, the camp was ready to receive campers. On opening day, July 9, 1961, there was a modern dining hall, 13 camper cabins, the Palace (now the Burrow), a pump house/maintenance cabin, a cooks' quarters and a director's cabin used also by administration staff. 366 girls attended during the 5 weeks of that first year. Following Margaret Robinson, Jessica Breski and Dorothy Smith shared directing duties until 1983. Jessica assumed the role alone from 1983 until 1989. During the 60's and 70's much of the development of the site for use in the activity program and the activity program itself were directed by Helen Robertson. Camping seasons ran 8 weeks until 1984 when they reduced to 6 weeks. However, weekends were added for girls and women in May, June and September during the later 80's. To mention by name the many people who were involved over the years would be impossible but many dedicated individuals and couples sacrificed much of their time and finances to lay the foundation for the worthwhile ministry at Walkerton. Between 1963 and 1966, three more cabins were added. They were located on the east side of the road and were used for a Tuck Shop (now Pines) and infirmary. By 1967, however, these cabins were used for kitchen staff, while new buildings were built beyond the dining hall for a larger infirmary and a more secluded cook's cabin. Over the early years many hours of selfless, dedicated labour went into site preparation each spring. Trails were cut and campsites developed on the Island and the Point. To the north, beyond the archery range, two river sites were developed and used in the '60's and '70's for all camp programs and Explorer campouts. These were named Pebble Beach and Stoney Bend. In 1997 Keith Hadigate was hired as the full time Executive Director. 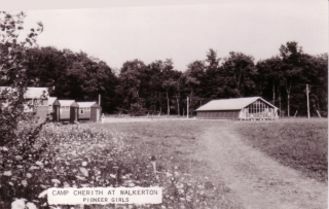 From a very humble beginning in 1961, the site at Walkerton has developed into a fine camp where girls and boys (since 1987) can enjoy the outdoors, learn skills and above all be introduced to the Lord Jesus Christ, as the one Person who has the answers for today's living. Cherith has always followed the theme, "Christ in every aspect of a person's life". Pray camp will always continue with this purpose.